Are you thinking about buying an engagement ring or getting engaged and starting to browse? Congratulations! Chances are, caught up in whimsy and romanticism, it’s been easy for you to lose sight of some practicality, or at least potentially do so. So how can you make the best choice about purchasing your perfect ring during such an exciting time? We rarely question diamond purchases prior to popping the question in detail or concerning practicality of cost, and more importantly, lifetime value. But the diamond industry is rich with misconceptions and inaccurate valuations, along with common misconceptions about how to accurately value diamonds themselves. So prior to purchasing your ring, it’s wise to really gain a comprehensive understanding of the industry, so you and your partner can make the best choice and a strong investment. It’s also important for you to bear in mind, while they are quite a commodity, diamonds themselves are not necessarily as “rare” as we’ve come to believe they are. They are actually produced in greater quantities than all other gems and ultimately, value always come down to rarity. But what exactly makes for the rarest, and consequently most valuable diamond? It’s typically never reflective of brand name, which may surprise you, and usually comes down to evaluating your diamond for specific specs across varying categories. So you must consider a multitude of factors concerning practicality of cost and value, in addition to considering aesthetic appeal and appreciating the sentimental time. Too often the industry confuses us, and both misconception and marketing can become a hinderance to purchasing a fairly valued engagement ring for your special day. You deserve nothing short of your dream engagement ring and wedding! By following this simple guide and learning more about the process, you can often make a more informed decision for what is likely one of the most important purchasing choices during your lifetime, and one of the most irreplaceable moments to share with a loved one. Irrespective of your unique budget, diamond rings of high-quality will typically not run cheap, but in understanding further background, you can certainly opt for a higher value ring that will yield accurate appraisal later on. One which can be accurately and fairly appraised and sold, if need be. One with available upgrades. More importantly, a ring that will mark a special moment in your life, as well as a wise investment for you and your partner. To start simply, diamonds typically have different valuations in accordance with the 4 C’s: Color, Clarity, Cut, and Carat. Too often even if you have a detailed understanding of each category, price distortions, and miscalculations can occur during manufacturing processes. Here is some more information about the 4 C’s, including how we can fairly evaluate the price and subsequent value of a diamond more specifically based on qualitative metrics. By understanding them and their corresponding grading scales, you will develop the foundational knowledge for how diamonds are typically appraised and valued higher, and can make an informed choice prior to your purchase. After this, you can read our guideline with steps to follow during the process of browsing for, and ultimately purchasing your engagement ring. Diamond color is a cornerstone of your engagement rings value and subsequent appraisal valuation, so having foundational understanding of this aspect is important. The more colorless a white diamond is, and certain diamonds are indeed devoid of any color at all, the more valuable and rare it is, and generally (often dependent on cut), the more improved the overall aesthetic is. Most wouldn’t consider a yellow tone or tint to a white diamond as attractive, and when coloring is present, less natural color is reflected back to the eye. So value of the engagement ring relies partially on it’s color scale value (you may view the grading chart below), and partially in absence of its color. Both value and grade of diamonds differ between colorless and those that are colored. Typical engagement rings are of the nearly colorless variety, and the cut of the ring may make the color variety more or less important (i.e. cushion cuts will retain more color). Color is graded on a scale ranging from Colorless (D, E, F), Nearly Colorless (G, H, I, J), Faint Tint (K, L, M), Very Light Tint (N, R), and Light Tint (S-Z). D (colorless) represents the highest color grade, with nearly no color, and appears colorless under magnification lens. E and F are nearly identical with respect to lack of color, and can usually only be detected different by a skilled gemologist. D-F colorless diamonds are typically set in white gold or platinum. Nearly colorless (G-J) grades appear colorless to the naked eye and primarily exhibit no color. While less rare than colorless (D-F) grade diamonds, they are found at a lower price point and typically still set in white gold or platinum. Faint tint (K-M) diamonds show a slight yellow tint visible to the naked eye, and are typically found for 50% less than nearly colorless (G-J) ranges, and are typically set in a warmer color. Very light tint (N-R) diamonds have visible yellow and brown tints, and are found at low cost (and low value). Light tint (S-Z) diamonds have a very visible brown or yellow tint as well, even more noticeable than N-R grade. GIA (Gemological Institute of America) is an independent entity with no financial involvement in the diamond industry, and objectively rates and grades diamond engagement rings and diamond quality using universal measures. Should I Purchase For Color? When browsing for engagement rings, you should take notice of any color tinting or reflections, taking caution to ensure it’s white and bright in relation to setting. While differences are usually quite subtle, and it may be unnecessary to invest in a difference not visible to the naked eye, it’s still important to take color scale into account with respect to an engagement rings total appraisal value. It’s also important to evaluate for the presence of any brown or yellow spots or areas of slight discoloration as you browse. Next, you’ll want to consider the clarity of your engagement ring. Natural diamonds undergo formation in the mantle layer of the earth and experience conditions of extreme heat, so naturally only some emerge from the process unscathed and still in clear, mint condition. The vast majority include some imperfections and blemishes, to highly variable degrees and different levels of visibility. Subsequently, the fewer inclusions and imperfections a diamond has, the higher its clarity grade, and corresponding value. However, there can be some difficulty in differentiating for scale with respect to clarify, as many differences are not detectable to the naked eye. This underscores the importance of using a trustworthy retailer with cutting-edge images who accurate and transparently provides this information and specifications when you select your perfect ring. GIA grades clarity on a scale ranging from Internally Flawless (IF, the best clarity level with no internal imperfection) to Inclusions 2 (I2, the lowest clarity level with the highest amount of inclusions). The total scale consists of Internally Flawless (IF), Very Very Small Inclusions 1 (VVS1), Very Very Small Inclusions 2 (VVS2), Very Small Inclusions 1 (VS1), Very Small Inclusions 2 (VS2), Small Inclusions 1 (SI1), Small Inclusions 2 (SI2), Inclusions 1 (I1), Inclusions 2 (I2). IF diamonds are extremely rare and have no internal or external perfections, VVS1 diamond clarity have no inclusions visible under 10x magnification, VVS2 diamonds have just barely visible inclusions using 10x magnification but are difficult to locate, VS1 have inclusions barely visible inclusions, VS2 diamond clarity levels are almost always visible using magnification, SI1 clarity inclusions are easily found but usually clean to the naked eye, SI2 clarity inclusions are clearly seen upon inspection and usually visible to the eye, and I1 clarity inclusions are always visible to the eye and more glaring than S12. Where the inclusion is located on the diamond will impact overall clarity ranking. For example, the closer the inclusion is to the center table, the more it will negatively effect clarity scale. If it is closer to the girdle, it may become more difficult to see, and subsequently influence clarity scale to a lesser degree. Of course, certain factors and clarity features may also be influenced by cut, shape or overall arrangements of the diamond, which may mask or highlight clarity blemishes. The relief denotes how visible the inclusion is in relation to the host diamond by contrast, and the lower the relief, the lighter the color may seem (influencing grading metrics for clarity). Of course, the grade will be measured in part by the presence of several clarity blemishes or inclusions, so the amount or number of defects to clarity will influence overall score. Likewise, the physical size of the inclusion will also play a role in overall scoring, with a larger inclusion causing a downgrade in overall clarity score. The characteristics of the inclusion, particularly with respect to depth, will play a role in overall clarity score. Any surface level defect that has not penetrated the diamond is considered a blemish, rather than an inclusion. Inclusions may vary highly in color (ranging from black to white), and none are exactly equal or the same. While the grade scale will take into account size and other features or characteristics, it will rarely be influenced by the color or specific position. Should I Purchase For Clarity? While clarity will certainly influence overall value of your engagement ring, in terms of aesthetic it is quite difficult to differentiate, particularly with respect to most higher grades and scales. You may think of it in simple terms as a measure of your rings imperfections. When you find SI1 and SI2 diamonds, you begin to notice inclusions more which may impact the overall aesthetic of your selection. But many differences in scale are invisible to the human eye. The difficulty of determining clarity underscore the importance of purchasing from a trusted, transparent retailer, such as Blue Nile, who offers detailed specs on every engagement ring as well as high-quality photos at different angles and degrees. They are also the largest e-commerce jewelry retailer and offer both transparency in practice and fair prices, that are often more accurate with respect to price valuation than any brand name or traditional jewel store, you may opt for a customized approach in finding the best individual design for your preferences. Here is an example of a beautiful S12, sold at an accurately appraised and valued rate, by the largest e-commerce jeweler and distributer of engagement rings. You will notice the vendor lists all relevant information and specs, including color, clarity, depth, and even polish and symmetry information. This type of information is usually limited or completely unavailable, particularly with name brand companies and in large chain retailers. This is generally because companies with brand name businesses charge more for diamonds (upwards of tens of thousands more with respect to pricier rings) with identical specifications, simply offering brand name appeal. The problem with this is brand name never yields higher valuation upon appraisal. Cut refers to the proportions of a diamond, for example its depth and angles. Relating to cut, there are certain sub-factors which can influence the overall value of the ring as well as the end product aesthetic. Ultimately, cut will influence appraisal value and overall value of your diamond engagement ring over time. GIA grades diamond cut on a scale ranging from “Excellent” to “Poor.” Excellent cut diamonds provide the highest level of fire and brilliance, almost all incoming light is reflected through the table, which adds radiance and magnificent sparkle. Very good cut diamonds offer exception fire and brilliance, with a large majority of eating light reflecting through the table. Good cut diamonds offer sparkle and brilliance, with much of the light reflecting through the table and into the naked eye. Fair cut diamond engagement rings offer limited brilliance, as light easily escapes through bottoms and sides (this may be suitable for side stones). Poor cut diamonds yield little if any sparkle, fire, or brilliance, as entering light escapes both the sides and bottom. Proportions refers to sizes and rations of the diamonds depth, width and table. This can impact the quality of the overall cut of the engagement ring. Proportions directly affect a diamond’s ability to reflect light and provide brilliance and are determined by ratios between size, angle and shape of each diamond facet. Variations of all of the components greatly determine how the diamond will interact with light, in turn impacting overall aesthetic and value. Symmetry refers to the ratios and precision of facets, mirrors, windows and steps of the engagement ring diamond. Polish is in reference to the overall shine and glow of the diamond’s surface, which lends itself to a more sparkly and brilliant end aesthetic. This refers to the diamond height, and is calculated by diving depth by width. Width refers to the measurement of the diamond from the widest diameter point to the other end of the girdle, and is typically only important in calculating depth percentage. Diamond table percent is calculated by dividing table width by the diameter of the diamond. If percent is too high, light won’t be as reflective and vibrancy will diminish. If it is too low, light will remain trapped inside, losing radiance as well. Ideal percents vary based on shape. Shape often gets confused with cut, however the latter refers to quality and the former refers to a standardized shape, i.e. cushion, round, or princess. Should I Purchase For Cut? When a diamond is poorly cut, irrespective of color or clarity gradings, light will not reflect into the eye as well, making for a duller overall aesthetic. Additionally, the quality of the cut greatly influences valuation and appraisal value of the piece. The highest quality cut diamonds will maximize light that strikes each pavilion. Light reflects back through the crown and table, rather than escaping through other parts. Cut greatly influences value, in some cases more than other factors such as color. So even on a budget it’s often advisable to select a smaller ring with higher cut quality, which may be appraised at a much higher rate. Traditionally we consider carat and sizing highly important in predicting the value of an engagement ring, but clarity and quality of cut can actually be more accurate predictors of strong valuation, and may also lend to a better overall aesthetic than simply focusing on size. With that stated, you will probably want to find the largest sizing possible that fits within your budget and still remains strong in quality and color. By opting for the lowest clarity and clarity levels (not visible to the eye), strong quality of cut, and reasonable carat sizing, you will likely find the most suitable engagement ring that yields the strongest valuation over time (when purchased from a reliable retailer or distributer). In terms of carat, you will likely want to find a ring that has the largest look, and making sure this is actually noticeable without economic waste. Cut may influence the appearance of sizing. A diamond carat is equivalent to 200 milligrams, so it is only a metric to determine weight. This carat weight correlates with the length and width (or diameter for round cuts). According to GIA, each carat can be divided into a points system, with one carat equalling 100 points. Diamond price increases exponentially, with a positive correlation to weight. So how does the sizing or carat weight influence the appearance of your ring? You’ll notice, the diameter size is not equivalent to carat weight, which is why the 2C ring does not appear twice as big as the 1C ring. In the United States, the most common engagement ring size is .90, or just under 1 Carat. An important factor to consider when you’re purchasing your ring is the markup prices involved in small sizing differences. When all other specs remain the same, the difference between a .9 C and 1C ring can cost thousands, purely for psychological appeal (the same can be said of small jumps in other categories). While the aesthetic of your ring may remain the same, you may find you’ll pay more for a very slight size increase. On average, you will pay around 40% more for an upgrade from a .90 Carat to a 1.0 Carat engagement ring. Now that we’ve reviewed the cornerstones for determining an accurate valuation in terms of the very important 4 C’s, you’re probably considering all of the subsequent steps in your selection process of your dream engagement ring. Choosing your perfect ring can be a time and energy-consuming task, and is likely one of the most important purchasing decisions in your lifetime. While personal factors and preferences will be highly variable and dependent, here is a general guideline for the process. This includes information on vendors and distributers, transparent practices, ethical concerns and standards, aesthetics, accurate valuation, preventing financial loss and ripoffs. We will also touch on colored diamonds, as well as the very important and often neglected setting (accounting for aesthetic, style, and value). This should help assuage fears you have and provide some clarification. During your selection process, your first step should be a comprehensive and detailed knowledge about the hallmark 4 C’s of diamonds, as explained above. You may elect to do additional background and research, including further charting and photo collection, and certainly should study these cornerstones of diamond aesthetic and valuation in relation to your specific engagement ring, particularly taking into account factors like cut, and shape. You’ll want to make sure you denote all factors while taking individual customization into account. From there, you may want to elect to speak with a trusted jeweler or merchant. Who you select and the company you work with can often make the difference between financial loss and the best decision of your life, so it’s certainly one that comes with a healthy degree of trepidation and strong consideration for everyone. While this may be a unique individual selection as well, in general you should seek a trusted retailer with transparent practices and accurate rates, who lists all specs in detail. Caution should likely be taken if specs seem to be missing, not included at all, or incomplete. You should definitely feel all the answers to your questions are met with clear and specific information, providing detailed and accurate facts alone. You should also purchase with a diamond grading report, an indisputable and accurate account of your ring enlisting all specifications. Lastly, you’ll want to protect and ensure your purchase, as it is of course a very high-value item that can be prone to issues of damage or theft. Once all of these steps are completed, you can take solace in a wise decision and let romanticism, and the magical whimsy of the moment supersede all else. The most important first step after acquiring relevant background is in selecting an appropriate retailer. While many of us consider name brands with established jewelry businesses, the ones who have been around for eras and become cultural references, these aren’t always the best selections concerning practicality. While there is a special psychological significance to the famed Robbin’s egg blue Tiffany box, a ring purchased from a name brand company can often be marked up by astronomical margins. The concern is, in the eyes of any jeweler or gemstone appraisal specialist, the name brand is meaningless. The 4 C’s are not only of the upmost importance, they are the only importance. This means that by purchasing a name brand ring, you run the risk of losing quite a bit of money over time (and in general). You will find that diamonds purchased separately from reliable vendors and distributers offer a remarkably higher value, and you can get engagement rings of identical quality with the same specifications for thousands, often tens of thousands, less. That means two rings of completely the same value, offering identical specifications, can be both purchased and appraised at completely different rates. By investing in a reliable and transparent retailer, you will obtain accurate appraisal, and not fall victim to significant potential losses later on. E-commerce retailer Blue Nile, for example, if the leader and highly reputable, well known for cutting-edge photos, and the largest available online stock. They offer leading rates and even price-matching options, as well as providing detailed and accurate information about the specs of every engagement ring they offer. These rings will likely yield the most accurate appraisal values, and make for the wisest choice with value in mind. As described above in the retailer selection process, name brand will certainly not matter with respect to fair or accurate appraisal during any valuation process. While we may think of certain name brand retailers with feelings of nostalgia and even trust, in researching background further this can quickly shift to full disillusionment. A name brand carrier is not necessarily indicative of quality, they do not offer information about details or specs, and the name itself will run you thousands of dollars. It will also not matter to any appraisal specialist later on. It’s consequently important only to steer away from such business, as it does not make for a wise investment. It’s recently been reported that even most diamond engagement rings sold by retail giant Costco are improved in terms of quality and certainly offer more cost per value than fine jeweler Tiffany and Co. For those with their hearts content on a certain beloved brand, you may opt to purchase a diamond from a reliable retailer with sound prices and opt for a setting with the brand. It’s akin to purchasing fine Italian leather, either in generic or designer format. One will carry the name and the higher price, both will carry the same quality. The difference is bags can be resold taking into account designer names, whereas jewelry will always be evaluated objectively by a trained gemologist. Additionally, nobody will ever know where the ring is from. Have you ever spotted a ring and said “that’s a gorgeous Harry Winston?” Likely not, if you evaluate objectively, we judge rings purely by aesthetic, and a wholesaler or online merchant offers identical, beautiful aesthetics at much lower cost to consumers. It is imperative, and a crucial first step, to request and obtain accurate certification for the engagement ring. This documentation protects your purchase as a lease would for your property rental. This documentation is not an appraisal, it is a formal summation of the exact stone quality characteristics and specifications. Any engagement ring should come with a GIA Diamond Grading Report, and should include any information regarding color treatment and proof of the items natural diamond status. Aesthetics can be a very personal and individual preference, but are likely one of the most important factors (along with accurate valuation) in the selection process. Because this is very much about personal preference, one should evaluate personal tastes by researching and comparing different shapes, cuts, and colors. Some may even desire a rare or unusual style, or a yellow diamond. Many others prefer more traditional options. This is the fun part! Once you have a full understanding of how to make the best purchasing decision, you can focus on creating the most aesthetically attractive ring. This is the ultimate lifetime accessory, which bears beauty, and endless nostalgia. One should take into account quality of cut respective to shape, as well as clarity and color for added brilliance and shine. Ethical concerns and practices, or questions about these practices, are quite common. They may hold personal importance or value. Irrespective of personal preferences, you will likely want to select a retailer who offers transparency regarding all of their ethical standards. Conscientious consumers often have varying concerns about the way products are sourced, and considering the diamond industry has been known for questionable mining practices, this makes for no exception to the source concern rule. Industrial mining companies, perform alluvial mining to source diamonds. This occurs mainly in African nations and is often performed by hand, in poor conditions, and an often painstaking process for the worker. They also often live in extreme poverty conditions, paid at rates of about $1 per day for hand mining in unsafe conditions. Sometimes these “workers” are even children, some of whom do not attend school. These unsafe conditions can and do lead to injury and death, as well as larger social issues and major disruption to communities. About 24% of the world’s diamonds come from alluvial mining sources, with about 15% of this being unregulated and informal. Certain retailers, such as Blue Nile, source all diamonds ethically and subscribe to the “Kimberly Process,” ensuring no painstaking hand mining processes have been employed in the manufacturing and sourcing of any loose diamond or engagement ring sold. One of the first steps you will want to take for insurance or upgrade reasons is obtaining a fair and accurate appraisal. You may do this using an accredited appraisal company in your area. There are a couple of important considerations during the appraisal process. First, you may opt (particularly during any resell process) to have it appraised by several companies or parties, as rates may fluctuate and you may receive different opinions. You should obtain and keep records and certificates on hand. You should also always take note of the quality and denote any damage as it occurs during use over time. If damage or wear occurs, you should of course treat that prior to any resell process. It’s always important to obtain the most accurate valuations and only consult with transparent and trustworthy parties to fairly ascertain value, particularly if selling the item. One point we haven’t touched on in this guideline are colored diamonds and their corresponding grading scales. “Fancy-Color Diamonds” are uniquely produced in nature and fall into D-Z scale color ranges, with organically occurring tones of blue, brown, pink, deep yellow and green. These diamonds are not as common, with the vast majority of diamond engagement rings falling in the D-Z color range scale. They are evaluated more highly for color intensity, with more vibrancy and deeper colors more highly valued. They are graded in accordance with hue (color), saturation (depth), and tonality (darkness of color). While most traditional diamonds are graded and valued higher for lack of color, the opposite is true with fancy-color diamonds, with the most saturation garnering the highest valuation. You may elect to do additional comprehensive research regarding colored diamonds specifically if you opt for one as your engagement ring selection. Retailer Blue Nile offers this Fancy Light Grey-Green Cushion-Cut Halo Diamond Engagement Ring, providing all specifications for the ring and stone settings. Another extremely important and often ignored part of your engagement ring is the setting. The main featured diamond in the center typically holds most of the weight of the ring, in terms of aesthetic and value, however we often downplay the setting and ignore specifications (if they are even provided). You will notice the majority of retailers, especially local store merchants and name-brand retail jewelers, do not even provide specifications for the stones on the setting, let alone provide any information about value. But the setting has quite an impact on overall value, aesthetic, and the interplay with the entire engagement ring. A poor setting with a lovely centerpiece lacks luster, and ultimately the details (the ones that matter), are what helps to bring together the perfect piece of jewelry. 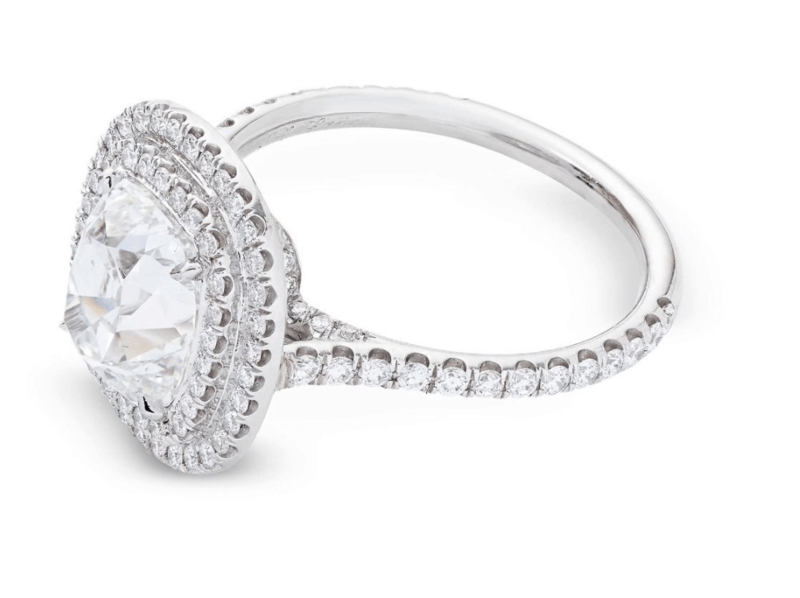 3-stone, halo, and diamond accents are the most popular settings, but many prefer traditional solitaire settings as well. It is important to pay attention to setting as well, as it can greatly influence the larger picture and interplay with the centerpiece. Unfortunately the engagement ring and diamond industry at large are as ripe with ripoffs and deceit as the reverse mortgage industry. This is why it’s all to important to do substantial research, no matter how time or energy consuming it seems at the time. This is a transient feeling and minimal price to pay compare to lost resources and financials down the road. We’ve established it typically doesn’t benefit us to purchase engagement rings from name-brand retailers and guidelines for avoiding certain merchants and retailers, so that begs the question, who can we trust in a competitive, yet difficult space to navigate? Of all the sources researched, one that has come up time and time again, and proved the test of both lovely aesthetic and strong value, is e-commerce jeweler Blue Nile. They are the leading online retailer of certified fine diamonds (by the highest quality independent labs). They have been praised by leading publications, like Forbes, and even The New York Times. With this retailer, all specs are transparent, even down to details about stones on settings, and taking into account information on all of the 4 C’s, even providing further details. This approach and information cannot be found with any name-brand supplier and customer service remains unparalleled in terms of excellence and satisfaction. You may even elect to customize or style your own ring, or purchase a diamond separately. They offer a full money-back guarantee that is honored without any questions over a 30 day period. By opting to work with a transparent and reliable leading retailer, you maximize aesthetic and value. This lends itself to higher valuation later on, and makes for a strong investment over time. When you decide on the purchase and take the steps in accordance with this guideline, all of the most enjoyable parts of the process will follow, including a perfect personal aesthetic and a valuable item that offers limitless nostalgia and sentimental value. While the sentimental is by far the most invaluable here, it is also important to act with practicality and not get swept up in solely marketing-based romanticism, taking into account lifetime value and subsequent appraisal valuations. But you will of course get swept up in organic romanticism, the feeling of which will outweigh any other emotion at the time, and make any stress worth it. It’s simply important for you to know the retailer you opt to work with can often make the difference between financial loss and a suitable lifetime investment that satisfies need with a fair and accurate purchase price. So, prior to taking the plunge, it’s always advisable to follow certain steps, do vigorous research with respect to background knowledge, and invest in your ring wisely. Selecting a merchant that offers attractive aesthetics, transparent information regarding specs, high-quality photos at all angles, and industry rates that are appropriate in accordance with value, is all a part of the process. And the process itself is so much more romantic and sentimental later on when it’s free of any stress. But the silver lining of the task is clearly reaping the limitless benefits with your loved one, and newfound spouse. Enjoy your moment as well as the investment, celebrate your love, and congratulations!